Apple could replace the Lightning port in its 2019 iPhone and iPad releases, a supply chain report claims, suggesting Apple is likely to give up on using its proprietary connection in its flagship products. Anonymous sources from "analog IC vendors" informed DigiTimes of the potential changes, including a redesign of chargers and related connections in its next-generation mobile devices. The report doesn't specifically confirm a change from Lightning to USB-C will take place, but strongly suggests Apple is considering making the switch in the future. This is not the first time rumors of a move from Lightning to USB Type-C has surfaced, as reports ahead of last year's launch of the iPhone 8 and iPhone X advised it was a possibility. The iPhone 8, iPhone 8 Plus, and iPhone X were all equipped with Lightning ports at the time of launch. The report adds that other rumors suggest a replacement of the connector will take place during the 2018 iPhone refresh, but doubts this to be the case. Apple is claimed to be in the "redesign phase" of the 2018 models, a stage in preproduction that does not allow for major specification changes, with sources suggesting this pushes any switch to USB-C to the 2019 models. While a number of Android smartphones are already using USB Type-C instead of microUSB, the report sources suggest Apple's adoption of the port will prompt other manufacturers to do the same. The sources cite a claim that Apple's use of USB Type-C in the MacBook lines has encouraged other notebook producers to use the technology in their own releases. For the moment, Apple does not have a major incentive to move to a USB Type-C connection for the iPhone. While USB-C offers fast-charging capabilities, iPhone X and iPhone 8 users are able to take advantage of this technology by using a USB-C-to-Lightning cable with a 30-watt USB-C power adapter. 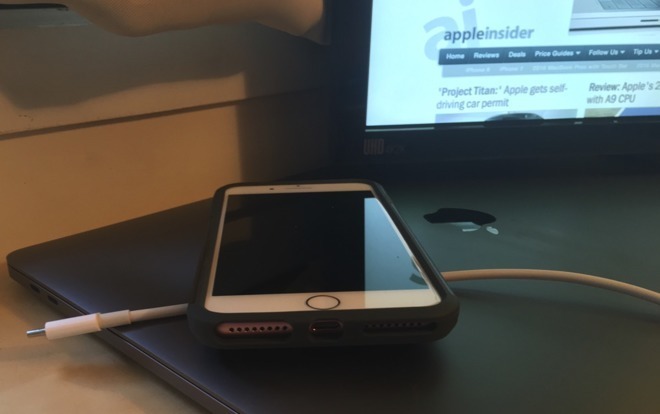 A rumor from May suggests Apple is already looking to provide iPhone users an 18-watt USB-C charger, which would enable users to enjoy fast charging straight away, without needing to buy the cable and a suitable charger separately. If true, this would be a major step towards adding USB-C to the iPhone itself. If Apple does make the change to USB-C, it would have a considerable impact on peripheral and accessory producers, forcing them to redesign their products to accommodate the connection, and to find ways to adapt their existing offerings.